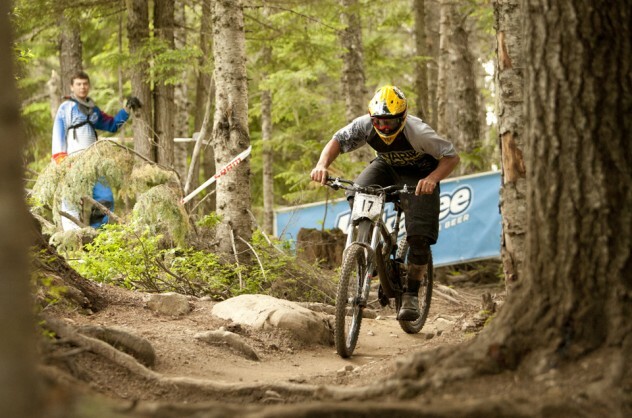 this photo is actually from the Garbo DH during Crankworx…. 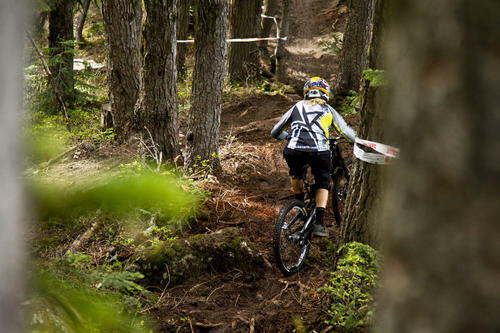 Every wednesday afternoon here in whistler they have a local race that draws up to 200 riders, its $2 entry, you dont actually know what track they are running untill the morning of the event as i guess this stops every man and his dog getting in a million runs in and an unfair advantage. They call it the beer league as its all about catching up with mates, fun, tales, lies, laughs, bears and beers afterwards at the GLC where the presentation is held and sometimes things can get a little messy there real quick and before you know it you end up spending the rest of the night in your beer stained stinking, sweaty, dusty race kit. I wasnt starting the day to well as my suspension on my bike wasnt feeling the best after 3 weeks of brutal punishment and needed some tuning but luckily enough the guys at marzocchi were still around town, i met up with naz and bryson martin who run the show and around lunchtime they put on a special M9 tuned rear rocco shock and tuned 888 forks with a new valve. One run down the hill and the difference was night and day so i was getting pumped again for the race later on that day. Claire and i headed up the mtn mid afternoon to squeeze in 3 runs of the tight rough track just before the racing started, it was tough trying to remember as there were so many turns, roots, rocks, shadows the sunlight on the track was crazy fading in and out of the trees playing tricks with your eyes. Claire said she felt a lot better on her bike after Bryson martin at marzocchi tweaked her fork as well, pumping and flowing and in the end was pretty happy with her run. I started off strong in my run but shortly after in the top section switchbacks i clipped the side of the track with my pedal and went over the bars into some trees, i got back up rolled on my bike and made sure my levers and bars were’nt bent or broken, straightened my goggles and then got pinning again thinking i could make some time up towards the bottom of the track which i knew better. I didnt bother checking my time at the finish i thought i would let it be untill the awards later that night. My buddy and part sponsor with sram components Tyler morland was racing aswell and over a beer he was telling me how during his run he hit a bear, yep, he was last man down and coming around a corner he nudged a bear in the bum, he said the bear was stunned at first but then took off like lightning. Mens 3rd place was NZ rider Nathan Rankin,somehow i was 2nd only .54 behind local paul stevens who won. Somehow i also managed to win more sram stuff thanks to a random draw prize, funny because i needed a new chain and derailure. Turned out to be a rad day in the end, bring on the next one!